President Muhammadu Buhari pledged on Monday to increase the salary, subsidies and pensions of the Nigerian police and tasked them to do more for the protection of human life. He gave the guarantee after his approval to adjust the salary structure of the rank, which would increase the salaries, subsidies and pensions of the police. 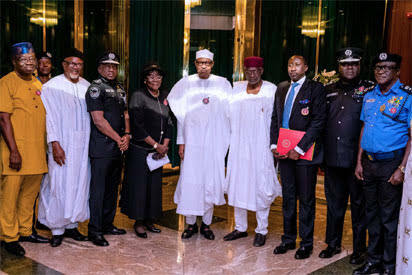 The President spoke on Monday in an audience with members of the Police Services Commission and the leadership of the Nigerian police who visited the State House in Abuja. He regretted that the inability of the police, in their constitutional role as a frontline force in the prevention of crime, had led to military participation in the maintenance of law and order throughout the country.